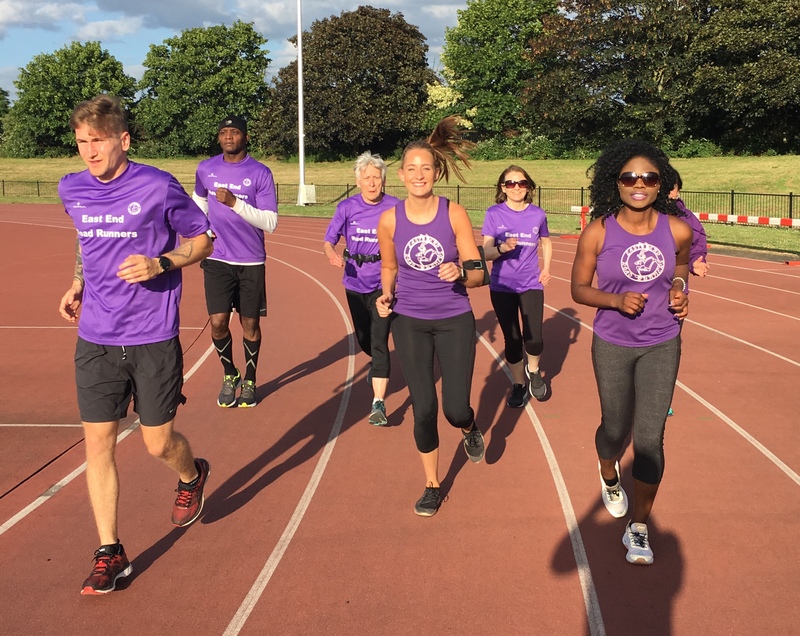 The club's main training night, unlike the majority of road running clubs, is a coached speedwork session, on the all-weather, modern synthetic, 400m track at Terence McMillan stadium. To provide a safe/secure/well lit envoirnment in which those new to running can build up their fitness and confidence. To enable those who have not yet run beyond 5K to attain the needed stamina to come on longer club runs on the roads. To enable those who have not yet run faster than 11 minutes per mile pace to attain the needed speed to come on longer club runs on the roads. To provide individually tailored, progressive speedwork régimes to aid improvement for all abilities and runners, 5K to Ultramarathon. To foster a competitive but friendly atmosphere so as to encourage improvement for all abilities and runners, 5K to Ultramarathon. To allow runners of all abilities to experience paces different to their more usual steady pace running. The sessions incorporate distances ranging from 400m to 2400m. All training is geared towards helping runners achieve their running and racing goals, and is based on their individual fitness levels. The yearly speedwork calendar is organised into two or three seasons, building through blocks of stamina-strength-speed. The warmer months are usually set aside for training aimed at benefiting 5K-10K racing, whilst the cooler months concentrate on speedwork for improving longer distances. All participants are encouraged to help in recording their times and efforts. This allows members to not only gauge their current fitness levels but also see any improvements over the different periodized training seasons. Coaches likewise are provided with useful feedback information with which to plan future training. In addition to standard interval work another favourite session sees members engage in 'hillwork' repeats; running circuits up and down the tree-lined banks surrounding the 400m track. Two or three times a year the Tuesday evening session will also include a shuttle run test. And roughly every six weeks or so the club holds a best effort 1.5 mile Time Trial. The results of speedwork training are frequently tested by members taking part in local short distance events like the FREE to enter, 5K distance Beckton Parkrun and Wanstead Flats Parkrun, both of which the club was instrumental in setting up, and helps run on a weekly basis.